I was supposed to meet with Jerry, Will and Mike at Furstenberg Park around 9:00 am. After the whole team had assembled, we worked and counted our way through Furstenberg, and then followed the Huron all the way down to South Pond. Mike later drove around town with me a bit in search of Crossbills or Trumpeter Swans, neither of which we found. and many American Robins and Goldfinches. But what was it that was so spectacular and never seen before on any CBC that even Cornell got all excited and had me writing reports and answering annoying questions again and again all weekend long? I know you won't believe it at first, so read twice, but as a matter of fact and beyond any doubt there was actually a flock of Easter Bluebirds! Isn't that exciting, Easter Birds on Christmas? I mean, Easter Bird species are only supposed to occur here after the first Sunday following the first full moon of spring! What the heck they were doing here now in the midst of winter I have no clue, but of course this observation adds fuel to the discussion on global warming, no doubt about that. The problem is that we were not able to document it by video or sound recording, so the record's acceptability is in the balance. To supplement for this lack of photographic evidence, I have uploaded a picture of another Easter Bird species I encountered here in May of 2005. Of course they are not that special in spring, but that one was a bit late and a very nice and somewhat unexpected addition to my trip list back then. Hope you enjoy it. 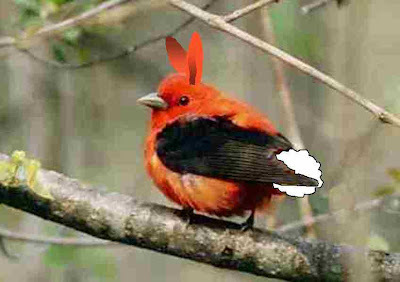 Due to the cold spring of 2005, this Bunny Tanager was belated on its way through Michigan and was seen in early May well after the normal Easter Bird migration period.